Our new Superfood Serum deeply penetrates skin to help plump, firm and brighten. The easily absorbed formula delivers essential vitamins, minerals & nutrients that contribute to skin vitality, helping firm and contour skin, brighten dark areas and boost radiance for a glowing luminous complexion. Awaken & enliven your skin and senses with Sweet Neroli, Grapefruit and Immortelle. Blended with grounding Vetivert and restorative Petigrain to re-energise your spirit and calm the mind. Active Ingredients Kojic Acid: Natural skin brightener. Reduces the appearance of dark spots. Vitamin C: Rich in antioxidants. Targets signs of aging, dullness & UV damage. Licorice: Improves the appearance of dark spots and uneven skin tone. Turmeric: Powerful skin rejuvenator for smoother, healthier looking skin. Ingredients Aqua, Rosa damascena (Rose) flower water**, Vegetable glycerin**, Biosaccaride gum-1, Caprylic / capric triglyceride**, Coco caprylate, Carthamus tinctorius (Safflower) seed oil**, Glyceryl stearate, Glyceryl stearyl citrate, Lactic acid, Propanediol, Citric acid, Tartaric acid, Gluconic acid, Sclerotium gum, Cetyl alcohol, Cetearyl alcohol, Rosa canina (Rosehip) seed oil**, Punica granatum (pomegranate) seed oil**, Hyaluronic acid, Magnesium Ascorbyl phosphate (Vitamin C), Persea gratissima (Avocado) oil**, Aloe barbadensis (aloe leaf) extract, Carrageenan, Brassica Oleracea (Broccoli) seed oil**, Tocopherol acetate, Camillia sinensis (Green tea) leaf extract*, Glycyrrhiza glabra (Licorice) root extract, Citrus grandis (Grapefruit) peel oil*, Tocopherol, Citrus aurantium dulcis (Neroli) flower Oil*, Citrus aurantium amara (Petitgrain) leaf oil*, Sodium citrate, Vanilla planifolia fruit extract*, Sodium phytate, Kojic acid, Cananga odorata (Ylang ylang) flower oil*, Curcuma longa (Turmeric) root oil*, Vetiveria zizanoides (Vetiver) root oil*, Helichrysum italicum (Immortelle) flower oil*. †Limonene, †Linalool, †Citral, †Eugenol, †Benzyl benzoate, †Benzyl salicylate, †Farnesol, †Benzyl alcohol, †Isoeugenol, †Benzyl cinnamate. *Organic, **Certified Organic. †Occurs naturally in Essential Oils. 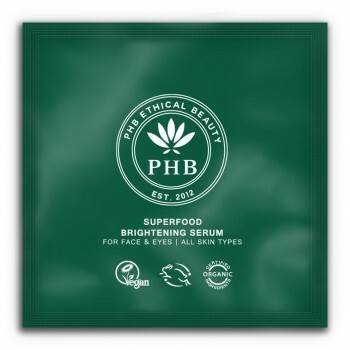 Try a Sample Sachet of PHB Superfood Facial OilThis is one of THE most sought after products from ou.. Try a Sample Sachet of PHB Skin Perfector Bio-GelOur new skin perfecting Bio-Gel blends the fi.. Try a Sample Sachet of PHB 2-in-1 Coffee Scrub & MaskWake up your skin’s sensational potential w.. 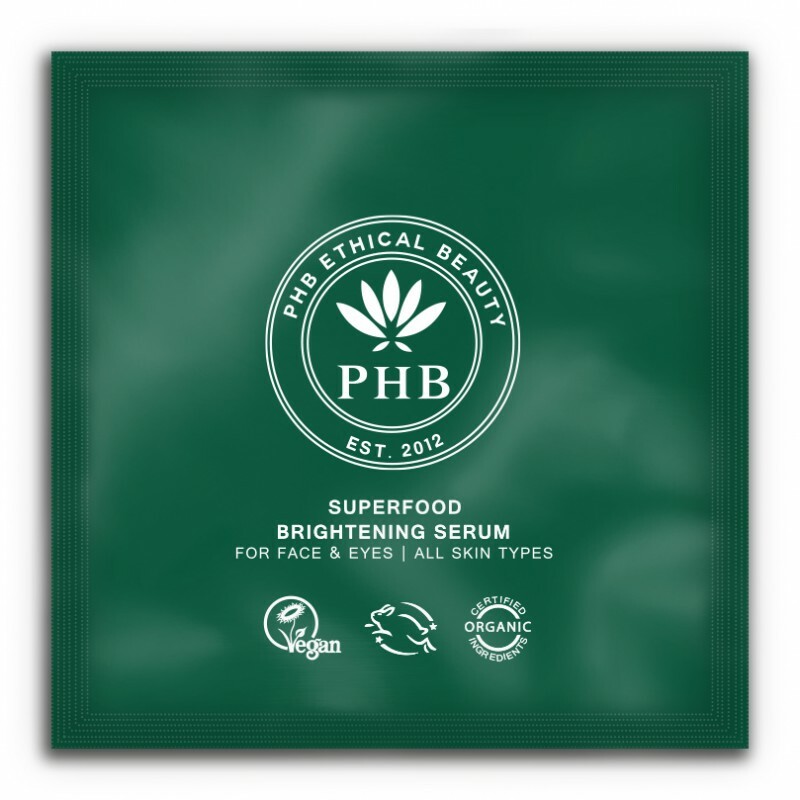 Try a Sample Sachet of PHB Balance Blemish GelTarget your blemishes with this new on the spot blemis.. Try a Sample Sachet of PHB Gentle MoisturiserSoothe sensitive skin with our Gentle Moisturising crea..